Whether starting now or looking to expand your online presence, we can build your eShop with the latest technologies, so that it is secure, fast and easy to use. Our eShops are well-designed using modern theme layouts that are further customized to be as functional as possible for your customer. 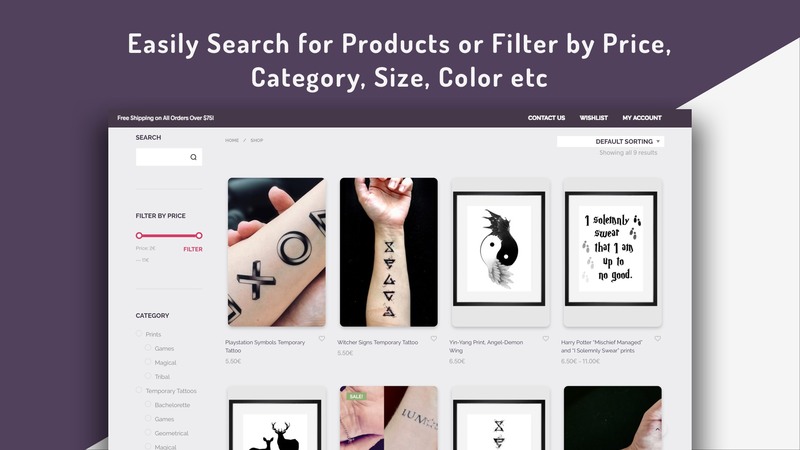 For example, the layout adapts to the user’s screen, navigation prompts are clear to see, there are various filters for the products along with product search and the cart page is clear and focused. No one wants to wait for a page to load. Loading times that are less than 3 seconds are critical to retain customers. Therefore, we optimize all our eShops for very fast loading times by employing all the latest techniques and technologies. We also use server optimizations for fast response times, content delivery networks (CDNs) and other appropriate solutions to achieve page loading times of less than 3 seconds for Europe and America. We follow all the latest practices in order to make your site secure and safe for your customers. We achieve that with HTTPS across the board, imposing secure passwords, firewall, DDoS protection and an always updated platform. However, no system is forever safe so we keep daily backups that can be restored promptly in case something goes wrong. Every eShop needs an easy way for customers to either directly search or filter existing products. We provide great customization over the available filters so that your customers always have control over what they are seeing. There is also direct search for products related to the keywords. We make sure your products are always highlighted with engaging images and beautiful information layouts. 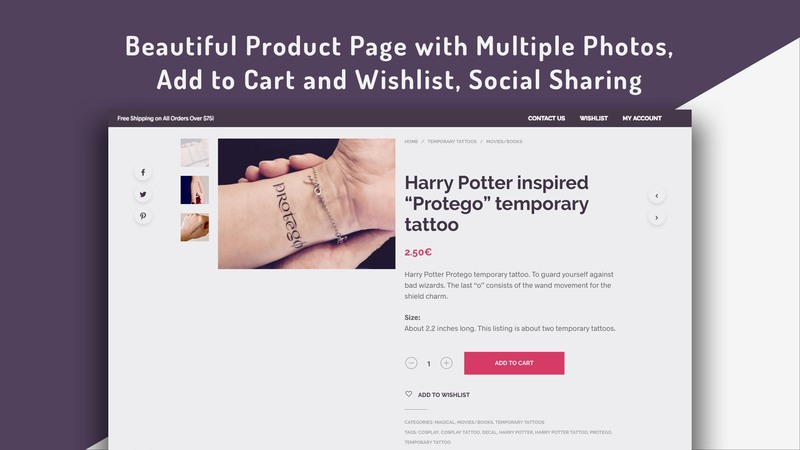 Customers can easily, browse products, learn more, add to cart or just share to social media all directly from the product page. A high percentage of e-commerce customers find the checkout page confusing and unable to generate trust. That is way we pay special attention to the checkout phase with a clean and friendly layout, so that the customer knows exactly what options are available at what cost. 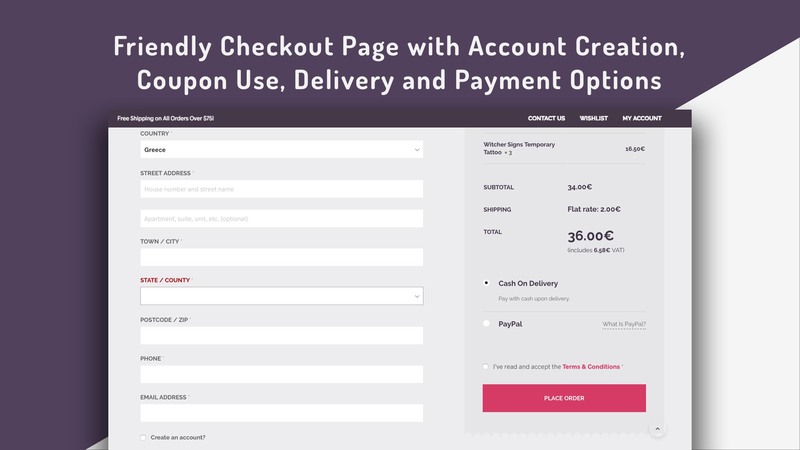 The customer can login to autocomplete all required fields, apply a coupon, create an account and choose from the available delivery and payment methods all in one page. All our eShops use the latest technologies and are constantly monitored and upgraded for optimal performance and reliability. We use the latest PHP version, PHP-FPM implementation, OpCache for PHP caching, Nginx as reverse proxy and microcaching to deliver sustained performance for high server loads. Moreover, we keep daily backups locally and on external spaces for extra piece of mind in case of an emergency. We use Jetpack to provide you with detailed information of your customers right at the back-end of your e-commerce site. We also integrate google analytics to your site and provide you with a weekly and monthly report with the most important metrics. Therefore, you can make informed decisions without having to become an expert in an analytics platform. Take a look at our prices and contact us to learn more! A great site complements the company’s brand, therefore to create the banners and the site’s appearance we require an existing branding identity (logo, color palette etc.). If you don’t already have one, we can create your branding with an extra cost of €250. SEO optimization refers to the site’s pages. During the training we will teach you to setup SEO yourself for each individual elements like products, product categories and blog posts. Further storage space can be allocated at an additional cost. If you need support for multiple languages there is an extra cost depending on the number of languages you require. *Credit Card handling may not be available in all countries or may require an additional cost in some.